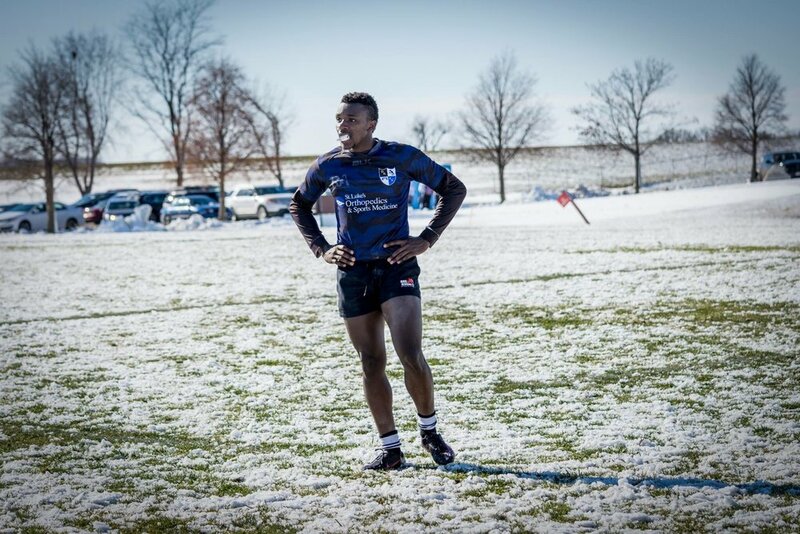 Nyangaresi during a snow game last year. Photo courtesy of Mike Kenyanya. It’s 6:30 on a Wednesday night, and the campus athletic fields are buzzing. Softballs are screaming over fences, flag football players are racing downfield, and the men’s club rugby team is grinding away as always on the far side, mostly hidden by a barrier of trees and bushes. They would be easy to write off as just another team in a class of many here at UMD, if it weren’t for a unique set of circumstances and one special team captain. Last February, UMD student and rugby player Will Grahek was fatally shot in his home. Besides the massive hole he left off the field with family and friends, there was another to be filled on it. Senior Randy Tanaka couldn’t help but feel somewhat lost. In Will’s memory, his parents created a scholarship in his name to be given to a player on the team each year. The scholarship was funded by donations from the public, according to the Duluth News Tribune. Although the players agree that their coach is responsible for getting them ready for game day, it’s up to them to occasionally push each other and strive to be better. It’s an important job, and one of those instrumental voices happens to be the man that received the scholarship in Will’s name, Nem Nyangaresi. A junior captain, Nyangaresi has carved out a niche for himself on the team. He recalls being presented the scholarship by Will’s parents before the first game of the season. He remembers early on after Will’s death, and how difficult it was to let go. Watching the rugby team at practice, each man is still doing his job, honing his craft and holding the guy next to him accountable. Nothing has changed on that front. What has changed, though, is the newfound bond that this group will share for the rest of their lives. Junior Noah Siiro believes it has given them a sense of unity. Nyangaresi with the Graheks, Jon and Heidi. Photo courtesy of Mike Kenyanya.